Hey, let me congratulate on deciding to learn more about local SEO for restaurant, you’re on the right track. In the past year, I have worked with several restaurant owners, chef’s, kitchen hobbyist’s, and niche local food retailers, and been a part of their journey towards success, using digital marketing, and focusing on local SEO in particular. All of these eateries and food stores were able to significantly increase footfall and monthly revenues, apart from being able to create a reputation or their restaurants. I’m sure you’ve searched for nearby restaurants on your mobile phones and tablets several times. Wouldn’t it be magical if even half of them could just head over your eatery? What do you need to do to make the ‘magic’ happen? Answer: It’s by learning and executing simple; tips and tricks of local SEO. Never heard of it? No worries; it’s simple enough, and I’ll tell you how to do it. Here are some stellar stats that showcase how the digital wave promises so much for restaurants, whether you’re associated with an international chain, or managing a local café. A 2014 paper from Sullivan, Higdon & Sink talked about how 26% Americans had ordered food from restaurants in the previous year. A 2016 curation of web stats from WordStream mentioned that 72% of local searches translated into real store visits. A 2014 Nielsen report found that almost half (49%) of Americans who used mobile payments did so at restaurants and eating joints. Now, let’s talk about the most significant benefits you stand to draw out via investing time in digital marketing and localized SEO for your restaurant or eating joint. Better understanding of the kinds of offers, cuisines, special menus that gather eyeballs and interest from readers, viewers, users, and visitors. Now that you’re interested and excited about learning some local SEO tips and tricks for the better online visibility of your restaurant, let me take you through the ones that have worked for me and my clients. How to Do Local SEO for Restaurant? If you’ve ever tried SEO earlier, I’m sure you know what ‘keyword research’ is. However, what surprises me how so many people consider this a purely ‘technical’ exercise. Agreed, you need to use tech tools to do this research, but it also involves your intelligence and understanding of your consumers’ behavior. Try to guess the search terms your target consumers will use while making searches on Search Engines like – Google. Example: If you own a Thai cuisine niche eatery in Boston, keywords like ‘best Thai food Boston’, ‘authentic Thai cuisine in Boston’ etc will work for you. Another trick is to look at Google’s top 10 search results for a search query, and see the kind of keywords and phrases being used by these pages. Also, use Google’s suggested search phrases (you can see them at the bottom of any search result page) and weave them into keywords. The trick is to use your intelligence and moon sense to filter out the best keywords from research tools. The title tag is among the top 3 important elements of on-page SEO (the other two are meta description and page body). A good title hooks the reader instantly, so invest time and thought into it. Also, Make sure to you use your main keyword in the title tag at earliest. Search engines consider title tags important while calculating your page’s ranking. The first part of website seen by a reader is the title tag; so it’s the first impression. Steer clear of use of conjunctions like can’t, won’t etc. Here is an example of results that showed up first page for a query ‘Thai food Boston’. Try to use keywords twice, without making them sound like ‘keyword stuffing’. Use keyword variation or find some LSI keywords. Must create a good impression and add a call to action. Images are an integral part of a restaurant’s digital marketing arsenal. I was actually surprised when a digital marketing colleague working for a renowned pizzeria in New York told me how his customer paid significant amounts to graphics designers and specialist food photographers to create visuals for their web pages. I am not asking you to spend money on getting HD quality food images, just setting the perspective for you to understand that this is important. Ask a hobbyist photographer to do the job for you, to begin with. One important aspect here is to take care of Alt tags for your images. This makes your images also relevant for search results. Whereas CMS like WordPress allow automatic ways to add image Alt tags, you might need to do so via HTML otherwise. Get to know image Alt tags better, here. Ever seen a search result with additional information, such as contact information of the restaurant, image of the head chef, user ratings, etc? It’s natural human behavior to click on such contextualized search results, which increases the potential of increased traffic for your restaurant website. These rich snippets of information can be enabled through the use of SCHEMA. SCHEMA has literally been a game changer, for those who’ve been able to adopt it. I have first-hand experience of a local café’s sales doubling in 50 days since the implementation of SCHEMA empowered snippets. All major search engines, including Bing, Yahoo, and Google recognize these SCHEMA tags, and hence, there’s every reason for you to adopt these. See how these restaurants use SCHEME elements to stand out. The five tips covered till now contribute to what is technically called on-page Local SEO for your restaurant website. Let’s move on to the next pillar – Google+. Google+ is among the most underestimated channels of digital marketing and local SEO. All local SEO campaigns, I have managed for my clients have used Google+ as one of the key pillars of success. The first step is to get your Google+ business page, and here’s where you can set it up. You will need to verify that you actually are the owner (or authorized profile creator) for the restaurant. This verification can either be done through a code received on your cell phone, or via a unique coded postcard sent to you via mail. Even if you have several restaurants of a chain, you can add locations under the same business page. Your Google+ business page not only acts as a high ranking contact page for local searches made, but can also double up as a potent social media channel once you start putting blogs up there. Make sure you choose the most relevant option in the Categories option. Don’t choose ‘restaurant’ (which is pretty generic) when you’re actually a takeaway hamburgers fast food shop. Example: For one of my UK bagels and burgers eatery client in London, we used their opentable.co.uk links in their Google+ profile’s reservations field, which literally meant that web users could make a reservation to their restaurant within a few seconds of doing a generic search such as ‘bagel shop London’. This perfectly explains why it’s so important to maintain updated and comprehensive information on your Google+ restaurant page. Be smart with the images you use. Your restaurant logo is alright, but not the most important photo. Showcase images of your best foods, houseful restaurant at peak hours, happy waiters serving drinks to excited clients, and so on. Remember, in a situation where a group of friends is looking for a laid back pub to hang out at in your neighborhood, one good image on a search engine result page can do the trick for you. 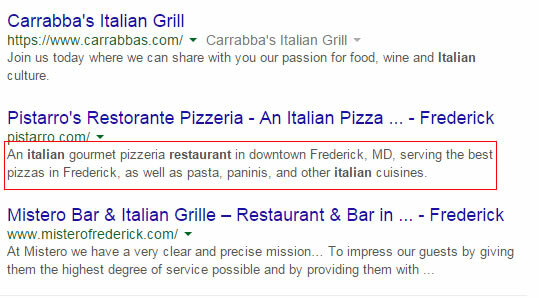 Next up, let’s learn some of the more successful off-page local SEO options you have as a restaurant owner. Restaurant directories make it much easier for startup eateries to make their presence felt on the web. I can tell from personal experience of working with a client who made some really special thin crust wood oven pizzas in New Delhi, is that there’s a lot to lose if you don’t quickly register with the most important of them all. Yelp and UrbanSpoon, of course, are among the more prominent ones. But there are so many other important restaurant directories that help provide publicity to your restaurant, that you can’t afford to ignore them. Not only do these profile pages act as high ranking web pages for your business (with the potential of featuring high in search engine result pages for your target keywords), but also help with brand equity and marketing. You can always add these profile links in your digital signatures, which adds a sense of professionalism to the marketing communication you do for your eatery. I’d personally not recommend you to use any directory submission service. Try to make your profiles highly professional and info rich. My advice: stick with a 5 directories a month target, ensuring your profile completeness score is 90% or above. Local newspapers, food magazines, and tabloids: Check out what you can do to get good reviews or some coverage in a local magazine. Once you have it, ensure you create a blog post out of it, and share it on all your social profiles. Local Blogs: Any local events and community blogs you know of? Do a Google search or two, and try to contribute some content to the blog, asking for either a Business Bio at the end of your blog-post or any citation (link) in a different form. Local Events/Fests/Carnivals: If you live in a big city, chances are there are routine city festivals near you. Try to watch out for such events, and their associated blogs and websites, where you can target getting a citation or two. Local SEO for your restaurant is not a big bang that you can be done with over a weekend. It’s a phase and continuous effort, which you’ll soon begin to enjoy as you see the ripple effects of additional traffic and more restaurant visits become a reality. I’d love to hear out your specific questions about any of the tips and tricks I have mentioned. Also, share your experiences with local SEO. I do trust all the ideas you have introduced on your post. They are really convincing and can definitely work. Thanks for stopping by. I appreciate your feedback.